Francesco Spinelli was born in Milan, Italy, on April 14, 1853. As a child, he would join his mother in visiting and helping the poor and the needy of Milan. He entertained other children by putting on puppet shows. 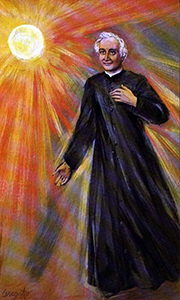 Francesco studied for the priesthood in Bergamo, Italy, and was ordained a priest in 1875. It was later in 1875 that he had a vision of women perpetually adoring the Blessed Sacrament. He was faithful to the duties of his ministry, teaching in the seminary during the day and running evening classes for the poor by night. 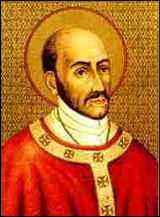 In 1882, he helped found a religious order that dedicated itself to the Eucharist and to Eucharistic adoration. But this effort failed, and Father Spinelli left Bergamo greatly saddened by what had happened. He moved to Cremona, Italy, and in 1892 he founded the Sisters Adorers of the Blessed Sacrament. They were given diocesan approval in 1897. This order continues its ministry of adoring and praying before the Blessed Sacrament throughout the world. Father Spinelli died on February 6, 1913. On the path to sainthood, he was known for the way he lived the Theological and the Cardinal Virtues. On October 14, 2018, Pope Francis declared him a saint of the Church. Primary Grades: Saint Francesco Spinelli used a talent he had—putting on puppet shows—to entertain other children. Invite the children to name talents they have and ways they can use their talents to bring joy to others. Intermediate Grades: Saint Francesco Spinelli’s first efforts to found a religious order dedicated to the Eucharist failed. His second attempt to do so succeeded. Share an age-appropriate example of a time when your first efforts at something failed, and how that experience made you feel. Then invite the young people to quietly reflect on a time when their first efforts at something failed, and how they felt. Invite volunteers to share what we can learn about handling failure from Saint Francesco Spinelli’s life story. Junior High: On the path to sainthood, Francesco Spinelli was known for the way he lived the Theological and the Cardinal Virtues. Review with the students the Theological Virtues and their meanings. Invite volunteers to name ways that Saint Francesco Spinelli lived these virtues, and how his life story can encourage young people to live these virtues too.